Surely if stopping to think about the places where your iPhone has had an "accident", would coincide with this infographic quite curious that we found earlier. Or did you never have pulled the nightstand? Or have you been on kamikaze plan to lower the car with the phone in his jacket pocket? Or has jumped from the kitchen counter while dinner prepare yourselves? It seems that you are not alone, and that 51% of accidents occur in our own iPhone home. 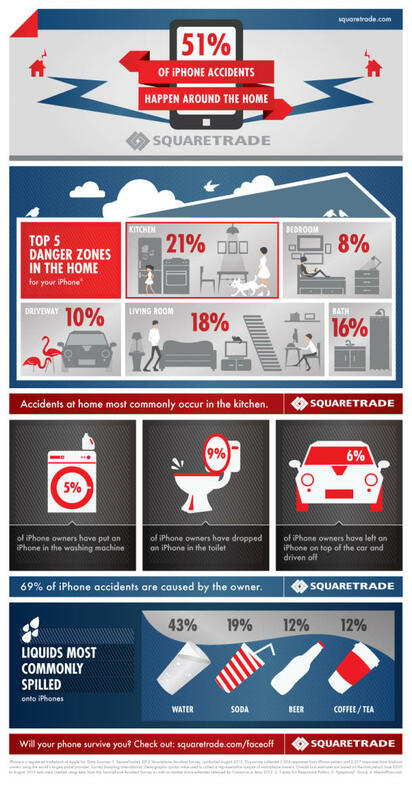 At least that is what tells us this infographic from SquareTrade (insurance company offering various electronic devices), where we show that parts of the house are the favorites of our iPhone for accidents ... In order of frequency: Kitchen, living room, bathroom, garage and bedroom.